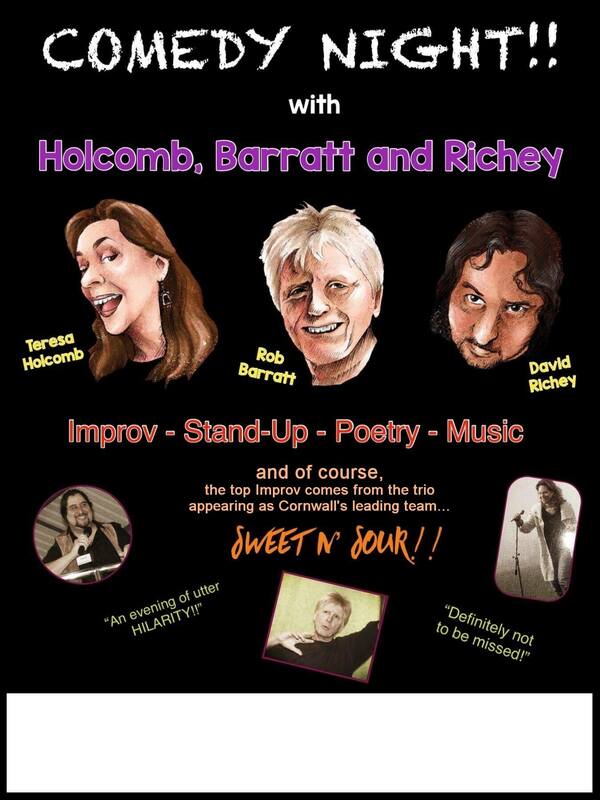 Holcomb, Barratt and Richey is a comedy trio comprising comedy performers from varying disciplines who combine their skills to create humour of the very best. They each have their own areas of speciality which they display individually, but also work under the group title of Sweet n’ Sour, performing Improvised Comedy. ​Through a series of games, not unlike the popular TV show, ‘Whose Line is it Anyway?’ they incorporate audience suggestions into an array of scenes that range from high-end humorous wordplay to the blatantly absurd. ​Interspersed with the improvisation games, the team have their own individual moments that bring to the fore the variety of skills that make up the group. ​So an improvised scene featuring all the players may then be followed by a blast of stand-up from American comic Teresa Holcomb or a cascade of rhythm and rhyme from the poetry of Rob Barratt, or comedy songs and stand-up from David Richey. ​The shows are billed as ‘An Evening of Comedy…’ and that’s just what they are. The audience spends a couple of hours with three funny people who enjoy making each other laugh. They are then drawn into that environment and carried along with the fun!